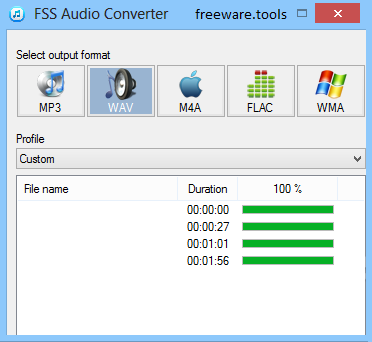 FSS Audio Converter is a simple-to-use piece of software that that convert audio tracks to different formats, namely MP3, WAV, M4A, FLAC, WMA, AAC, OGG, MP2 and AMR. The interface is user-friendly, consisting of a regular window with an organized structure, where you can add files with the help of the file browser or folder view. As you may have suspected, batch processing is supported, which means you can work with multiple items at once to reduce overall task duration. FSS Audio Converter also integrates an option for merging all sound files into a single item. FSS Audio Converter is a simple-to-use piece of software that that convert audio tracks to different formats, namely MP3, WAV, M4A, FLAC, WMA, AAC, OGG, MP2 and AMR. It comes packed with a few intuitive options that should please novices and more experienced users alike. The setup operation does not take a long time to finish. However, users should pay attention to the wizard, as FSS Audio Converter offers to download and install third-party components that it does not need to work properly. FSS Audio Converter also integrates an option for merging all sound files into a single item, as well as for previewing them in a built-in player. There are no other notable features available. The app leaves a minimal footprint on system performance, as it consumes low CPU and RAM. It delivers speedy conversions and quality sound. All in all, FSS Audio Converter is an intuitive piece of software for quickly turning audio files into other popular formats, featuring support for profile configuration for advanced users.